Aishah Mutidi put three children through school. Now she’s the caregiver for a bright young girl just starting sixth grade at Eulalie Rivera Elementary. “I’m very serious about the kids and learning because I know the learning process is very, very serious," Mutidi said. 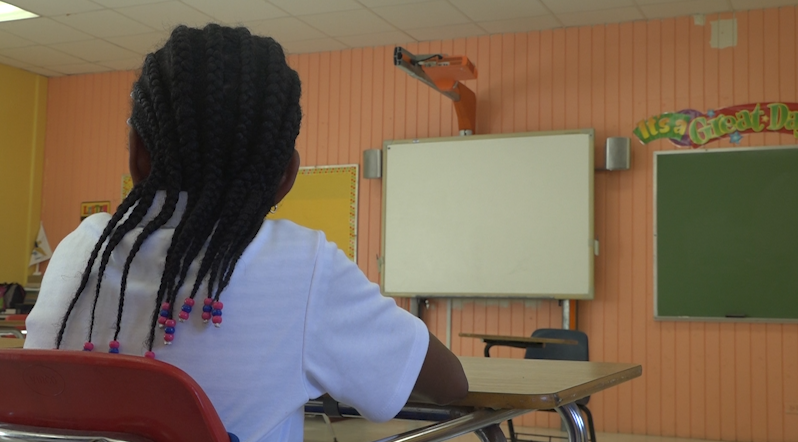 Due to on-going construction from last year’s hurricanes and delays with modular classroom delivery, the start date at this school in St. Croix was pushed back. The first day of school now October 1st. Deputy Superintendent Vaughn Hewitt said the important thing is that they’re back, and open for learning. “Students are here, their parents are with them I see excited students I see excited parents, students right now are in the classroom they’re actually getting instruction as we speak, that is what we wanted to see," Hewitt said. But some in the community argue there was no need for the delay and that the school should have had a backup plan. “Based on what they saw and that the modular were not arriving to the island they should have gone back to the drawing board with a Plan B," Darrel “Boogle” Stevens, a Senatorial Candidate said. Stevens has been visiting the school in the days leading up to the opening. He was the one that found signs of mold in one of the buildings just a week ago and reported it to the assistant principle. They immediately took action, blocked the building off and moved kids into a different classroom. Stevens said his biggest concern now is make up days for the delays. But for parents, like Mutidi she’s just happy to have her sixth grader back in school and learning again. Now while the school has reopened there is plenty of work left to do, the library and main offices, have yet to be finished but they tell me that they will be done soon, but then it begins the long road to rebuilding the school, itself.